C.A. Gray is the author of the YA Fantasy PIERCING THE VEIL trilogy, as well as the NA Dystopian series, THE LIBERTY BOX. By day, she is a Naturopathic Medical Doctor (NMD), with a primary care practice in Tucson, Arizona. Additionally, she writes medical books under her real name. 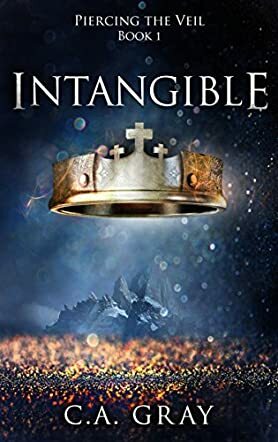 Intangible by C.A. Gray is the first book in the Piercing the Veil series. Peter Stewart is the ultimate science geek who fits into his high school about as well as a cowboy boot fits into a fairy princess tea party. If it weren’t for his best friend Cole, Peter wouldn’t think twice about skipping the rest of his high school years and moving right on to university. Before he has a chance to make that decision though, a strange accident that mirrors one of his dreams acts as a catalyst to an unbelievable life and death adventure where Peter and his friends play integral roles in saving each other and the world. I loved Intangible by C.A. Gray. Not only are the characters likable, the integration of science facts into a magical world eased me out of reality and into fantasy. I didn’t have to so much suspend disbelief as understand the science behind natural phenomena. Peter, Lily, Brock and all the other characters were relatable, and their interactions are realistic. The necessary backstory was broken up into nice sized bites of information as needed, so the story did not drag. The action sequences are brilliantly orchestrated, and the magical elements are visually inspiring. I recommend Intangible to anyone looking for a break from reality, and I can’t wait for the next book in the Piercing the Veil series. Gray has proven herself an exceptional storyteller and fantasy world weaver. I predict she will go far in her writing career.